Narrowboating Chick | Later Start- Later Finishing in the Day. Well, the forecasters were correct and we woke up to the sound of rain on the roof. Not just light showers, but the heavy, in for the day, rain that comes in heavy bursts. We made the most of the opportunity and had a lie in and a leisurely breakfast. I even had to light the fire…in late May!!! Anyway. The rain eased off about 11.00 ish and, as is normal at the end of a trip, we were thinking about our schedule, so Marcus set off. 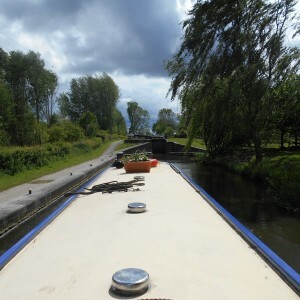 Fortunately the rain eased off and by the time we got to Fazeley Junction we had bright sunshine. A quick stop to empty the toilet and we were off again, at least hoping to get up the Curdworth flight by this evening. The weather was sunny but the chilly wind still remained, so I decided to be the lock winder, but the gates and paddles were so bloody stiff and heavy that I gave up at the first lock and let Marcus do the winding. We were following a boat, but they seemed quite efficient and we did not catch them up. A few boats coming down meant that we got ahead a little quicker. The last lock is a little way from the preceding one and the pound seemed to be very low on water and sure enough, we (I) got stuck on the bottom, just beyond the M6 Toll bridge. 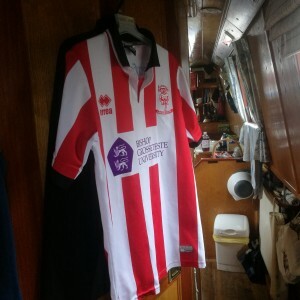 Fortunately, we had a professional on board and Marcus had her free in no time. 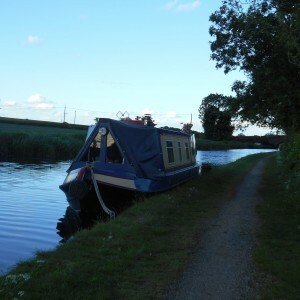 Evening was fast approaching, so we stopped for the night, just below Minworth at the same spot we moored at when we were last here with Aqua Roma.